Luck's just another word for destiny … either you make your own or you're screwed. 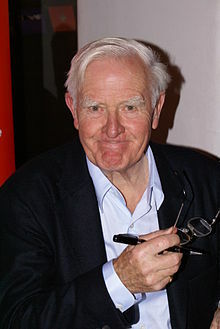 John le Carré is the pen-name of David John Moore Cornwell (born 19 October 1931), a British writer of spy novels, and a former spy himself. I use the furniture of espionage to amuse the reader, to make the reader listen to me, because most people like to read about intrigue and spies. I hope to provide a metaphor for the average reader's daily life. Most of us live in a slightly conspiratorial relationship with our employer and perhaps with our marriage. I think what gives my works whatever universality they have is that they use the metaphysical secret world to describe some realities of the overt world. "This is a war," Leamas replied. "It's graphic and unpleasant because it's fought on a tiny scale, at close range; fought with a wastage of innocent life sometimes, I admit. But it's nothing, nothing at all beside other wars – the last or the next." He worked for the fleshy side of the Foreign Office and his job consisted of lunching visiting dignitaries whom no one else would have entertained in his woodshed. Blackmail is more effective than bribery. So odd to think of the Devil as a fumbler! The neglected are too easily killed. Balls, the lot of it. It's death, that's what I'm suffering from. The systematic encroachment of the big D.
You see a lot — your eyes get very painful. There's one thing worse than change and that's the status quo. Savages...are by nature rash. They have no middle gear. The middle gear of any man is self-discipline. Luck's just another word for destiny...either you make your own or you're screwed. If you're in a hole, don't dig, they say. When you assimilate, you choose. Elections are a Western jerk-off. Why is it that so many men of small stature have more courage than men of size? Peace, gentlemen, it is well known, does not come of its own accord, and neither does freedom. Peace has enemies. Peace must be won by the sword. The friends of my friends are my friends. Never trade a secret, you'll always get the short end of the bargain. We were both hybrids: I by birth, he by education. We had both taken too many steps away from the country that had borne us to belong anywhere with ease. No problem exists in isolation, one must first reduce it to its basic components, then tackle each component in turn. A good man knows when to sacrifice himself, a bad man survives but loses his soul. Nothing in life... even a few broken bones, is without its reward. There are some Arabs who think that the Germans did the right thing by the Jews. This makes it easy to recruit Arab terrorist. There is a big difference between fighting the cold war and fighting radical Islam. The rules have changed and we haven't. We were not faced (in the cold war) in a conflict with people who are prepared to die for their cause. We weren't in conflict with people whose idea is to kill as many as they could. In the war on terror we did everything wrong that we could have done. You can't make war against terror. Terror is a technique of battle. It's a tactic that has been employed since time immemorial. You can conduct clandestine action against terrorists, and that must be done. Because we are so unfamiliar with the motivation of the people we are dealing with, we are more afraid of them than we need to be.